The usual way that Keynesians explain the post-[World War II] expansion despite the huge cut in government spending is to say, well of course the economy boomed, there was a lot of pent-up demand. What does that mean? There is always pent-up demand in the sense there is a stuff I wish I could have but can’t. But the standard story is that people couldn’t buy washing machines or cars during the war–they were rationed or simply unavailable or unaffordable. So when the war ended, and rationing and price controls ended, people were eager to buy these things. But the reason these consumer goods were rationed or unavailable is because all the steel went into the tanks and planes during the war. So when the war ended, there was steel available to the private sector. That’s why cutting government activity can stimulate the private sector. Fewer resources are being commandeered by the public sector. One of the most mindless aspects of the multiplier is to treat is as a constant, such as 1.52. It can’t be a constant, not in any meaningful way. If the government conscripted half of the US population to dig holes all day and conscripted the other half to fill them back in, and paid each of us a billion dollars a day for the task, and valued holes that were dug and holes that were filled in at a trillion dollars a hole, then GDP would be very very large, unemployment would be zero and there would be no stimulating effect and we would soon be dead from starvation. Conventional wisdom has it that the entry of the United States into World War II caused the end of the Great Depression in this country. 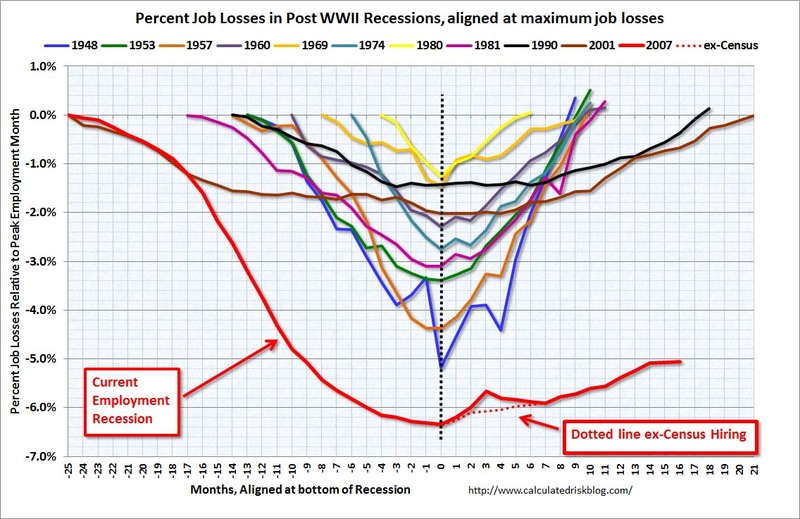 My variant is that World War II led to a “glut” of private saving because (1) government spending caused full employment, but (2) workers and businesses were forced to save much of their income because the massive shift of output toward the war effort forestalled spending on private consumption and investment goods. The resulting cash “glut” fueled post-war consumption and investment spending. I shall argue here that the economy remained in the depression as late as 1940 because private investment had never recovered sufficiently after its collapse during the Great Contraction. During the war, private investment fell to much lower levels, and the federal government itself became the chief investor, directing investment into building up the nation’s capacity to produce munitions. After the war ended, private investment, for the first time since the 1920s, rose to and remained at levels sufficient to create a prosperous and normally growing economy. I shall argue further that the insufficiency of private investment from 1935 through 1940 reflected a pervasive uncertainty among investors about the security of their property rights in their capital and its prospective returns. This uncertainty arose, especially though not exclusively, from the character of federal government actions and the nature of the Roosevelt administration during the so-called Second New Deal from 1935 to 1940. Starting in 1940 the makeup of FDR’s administration changed substantially as probusiness men began to replace dedicated New Dealers in many positions, including most of the offices of high authority in the war-command economy. Congressional changes in the elections from 1938 onward reinforced the movement away from the New Deal, strengthening the so-called Conservative Coalition. From 1941 through 1945, however, the less hostile character of the administration expressed itself in decisions about how to manage the warcommand economy; therefore, with private investment replaced by direct government investment, the diminished fears of investors could not give rise to a revival of private investment spending. In 1945 the death of Roosevelt and the succession of Harry S Truman and his administration completed the shift from a political regime investors perceived as full of uncertainty to one in which they felt much more confident about the security of their private property rights. Sufficiently sanguine for the first time since 1929, and finally freed from government restraints on private investment for civilian purposes, investors set in motion the postwar investment boom that powered the economy’s return to sustained prosperity notwithstanding the drastic reduction of federal government spending from its extraordinarily elevated wartime levels. Higgs’s explanation isn’t inconsistent with mine, but it’s incomplete. Higgs overlooks the powerful influence of the large cash balances that individuals and corporations had accumulated during the war years. It’s true that because the war was a massive resource “sink” those cash balances didn’t represent real assets. But the cash was there, nevertheless, waiting to be spent on consumption goods and to be made available for capital investments through purchases of equities and debt. Derived from Bureau of Economic Analysis, National Income and Product Accounts Tables: 5.1, Saving and Investment. Gross private saving is analagous to cash flow; net private saving is analagous to cash flow less an allowance for depreciation. 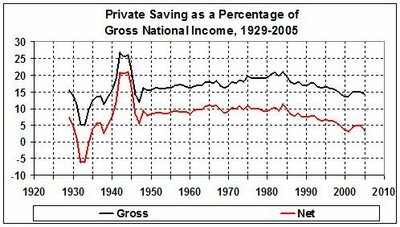 The bulge in gross private saving represents pent-up demand for consumption and investment spending, which was released after the war. private consumption spending, which — because of the privations of the Great Depression and the war years — would have risen sharply regardless of the political climate. The post continues with an exchange between Higgs and me. The bottom line is the same. What is the answer to the title question, then? It is that a period of forced, nominal saving can create pent-up demand, which can result in the employment of resources that had theretofore been unavailable. The pent-up demand at the end of World War II was, in great measure, responsible for the post-war recovery. This rare phenomenon has nothing to do with the multiplier, and probably has nothing to do with the current economic situation. Government has commandeered a large chunk of the American economy, but so gradually that Americans have not acquire a “glut” of nominal savings, as they did in World War II. This paper does not contain a numerical estimate of the government purchases multiplier. However, its examination of data exclusively from the 2008-9 recession suggests that sectoral and aggregate employment and output vary with supply conditions in much the same way they did before the recession. The results contradict Keynesian claims that the government purchases multiplier would be significantly greater during the recession than it was before 2008, suggesting instead that historical estimates of the effects of fiscal policies are informative about fiscal policy effects in more recent years. Moreover, the supply incentives created by government spending cannot be ignored merely because 2008 and 2009 were recession years; rather incentives mattered as much as ever. Government purchases likely moved factors away from activities that would have supported private purchases. Unemployment insurance, food stamps, and other expanding means-tested government programs likely reduced employment and output during this recession, in much the same way they did in years past. [t]he greatest periods of American economic growth came when taxes were very low—such as in the 19th century—or being lowered and simplified, as in the 1920s, 60s, and 80s. Inescapably, to tax wealth creation is to discourage it. But there is a large and politically potent segment of the population that, because its interests are now aligned with those of the government, seek to promote dependency through entitlements. This segment favors ever higher taxes (although they disguise the fact by demanding that only “the rich” pay their “fair share.”) But, as with regulation, high taxes inevitably produce low growth—and low growth threatens entitlements in the long term. If the United States remains in the doldrums for several more years without hope of a real turnaround, Medicare as it is currently constituted will go bankrupt in 2019. Raising taxes to prevent that will only slow overall growth, and that will actually defeat the purpose of saving Medicare. But there is no point in cutting taxes unless government spending is cut — and cut drastically — for government spending, along with regulation, is the real drag on the economy. Only in the left’s magical thinking is government spending a good thing. In reality, it is a destructive force — even during recessions and depressions. This post examines practical reasons for the failure of “stimulus” to stimulate and the “multiplier” to multiply. The deeper truth is that the Keynesian multiplier is a mathematical fiction, as explained here, and government spending is in fact destructive of economic growth, as discussed here and in some of the posts listed at the end. “Liberal” economists and pundits complain incessantly that the recovery from the Great Recession is weak, and in jeopardy, because the federal government hasn’t spent “enough” money. (See this for some examples of the “liberal” view.) How much is “enough” for Paul Krugman et al.? It is always more than the government spends, of course. Why should that be? The blindingly obvious answer — but not obvious to Krugman and company — is that demand-side fiscal policy (i.e., government “stimulus” spending) is ineffective. If the economy depends on government spending, how does one explain the decades after the Civil War, when government spent less than 10 percent of GDP (vs. today’s 40 percent), while America’s economy grew faster than at any time in its history? It took World War II and regime change (the disruption of the New Deal by the war) to end the Great Depression. Mr. Roosevelt’s adoption of Mr. Keynes’s hole-digging prescription (the Civilian Conservation Corps and similar make-work projects) had nothing to do with it. Mr. Roosevelt may have been an excellent marketeer, but he was a dismal economic engineer. Despite the promises of Obama, Romer, and company, the “stimulus” has evidently failed to do much — if anything — to alleviate the Great Recession and its lingering aftermath. (See this, this, and this, for example.) Thus the wailing and gnashing of teeth by Krugman and company — who want to replicate the failure on a grander scale. 1. The “leakage” to imports, as indicated by de Jasay. 2. The disincentivizing effects of government borrowing and spending, to which de Jasay alludes. a. dG must lead directly to the employment of resources that had been idled by a downturn in economic activity (or newly available resources that otherwise would lay idle), therefore eliciting the production of additional goods for delivery to consumers and businesses. b. Accordingly, government functionaries must be able to distinguish between unemployment that occurs as a result of normal (and continuous) structural changes in the economy and unemployment that occurs because of a general slowdown in economic activity. 4. Causality: Inadequate AD as symptom, not cause. 5. Inequity, moral hazard, and their consequences. Small businesses aren’t cowed by regime uncertainty, taxes, and red tape, and all of those other “wonderful” things about which Krugman knows nothing. Krugman’s first point aligns with his stubborn insistence — against mountains of evidence to the contrary– that government is benign and free-markets are malign. Krugman’s second point aligns with his simplistic Keynsian view of the world, in which GDP is a homogeneous substance, like water, the level of which can be raised or lowered in a trice by government spending or the lack thereof. There’s no room in the Krugmanesque view of the world for real firms, run by real people, staffed by real people, producing myriad goods and services in myriad ways, and subject to the whims of Washington and thousands of State and local governments. To say that small-businesspersons are reluctant to hire because there is inadequate demand for their products is like saying that a sick person is lying down because he doesn’t feel well. It’s a banal and incomplete interpretation of the situation. In any event, the fact that small businesses — and businesses in general — haven’t resumed hiring at the pre-recession rate is not an argument for mindless pump-priming. If it is an argument for anything, it is an argument for government to get out of the way. Were the government a business, with a strong incentive to perform services of value to willing buyers, it would get out of the business of managing the economy and stick to what it does best: dispense justice and defend the nation. That it often fails to do those things well should be a clue to the Krugmans of the world about their risible faith in the wise, omniscient, and efficient government of their imagining. To write about Krugman is to grant him the favor of being taken seriously. Basta!